Team Third Law’s coaches and competitors are always up for a road trip, so on January 16 they decided to make the 5-hour trip to Jacksonville for a Newbreed. It was well worth the trip, as they brought home 13 gold medals and took third place in both the Adult and Kids/Teens Team Trophies. Andy, by himself, was responsible for winning that third place in the kids divisions, fighting nine matches to win 7 gold medals by himself. For the coaches, Coaches Joe, Joey and Katy all won double gold, winning both their purple belt and no gi advanced divisions. Coach Joe won three matches for gold in his purple belt division, two by arm triangle and one by points. In no gi advanced, he won two matches by points, 12-0 and 13-0, for gold as well. Coach Joey won one match 13-0 for gold in his no gi advanced division, and one match by an advantage for gold in his purple belt division. Coach Katy won one match 8-0 in her purple belt division for gold and one match 5-0 in her no gi advanced division for gold. Andy fought in many different teens divisions, doing both his 14-15 year old division (he is 14), and also the 16-17 year olds division. He won a total of 7 gold medals. He won gold in his first 14/15 year old no gi advanced division, winning one fight by rear naked choke. Then in another teens 14/15 year old no gi advanced division he won one fight 12-0 for another gold. Then in 16/17 year olds no gi advanced he also won gold, wining his first fight by kimura and his second 5-0. He also won another teens no gi advanced division for gold. Andy also won gold in the 16/17 year olds blue belt division, winning two fights. The first was by kimura and the second. He also won gold in two separate 14/15 year old teens gi advanced divisions, winning one division by triangle and the other division by points. 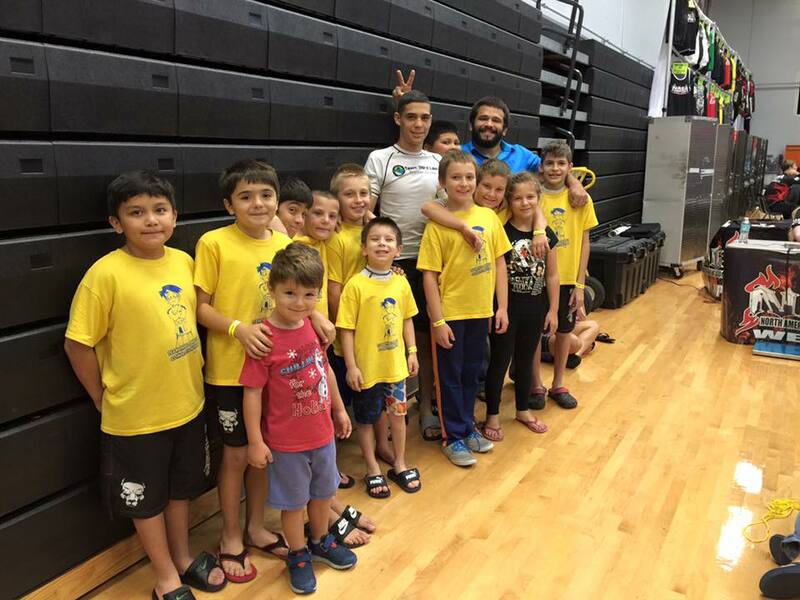 Then, at the end of the day, the Naples BJJ team was surprised to learn that with only one teen competitor the school had taken third place in the Kids/Teens team trophy. And with three adults wining two divisions each, they took third in the Adults team trophy as well. All in all, it was worth the trip! Next up for the adult BJJ competitors from Naples is the IBJJF’s Atlanta Open and Abu Dhabi Pro Trials in Orlando. Andy went to work the next weekend again at another Newbreed in Coral Springs, getting ready for his trip to California for the IBJJF’s Pan Kids in February.